A nonprofit forgoes the typical community meeting for a "living charrette," which leads to greater neighborhood feedback about a proposed 24-acre development in Austin. In traditional planning processes, developers work mostly alone to create their vision for a property. Then, usually only if required by city policies, developers solicit neighborhood input on their parboiled vision via two-dimensional renderings at meetings where minimal changes are incorporated to help secure the required zoning or code changes. This process often places property developers at odds with stakeholders and leaves neighborhoods feeling disrupted and excluded. For decades, city leaders and planners largely ignored the Govalle-Johnston Terrace neighborhood in East Austin. It was home to a gasoline storage “tank farm” for 40 years, was among the last neighborhoods to get paved streets, and it lacked critical services like sidewalks, clinics, and grocery stores. These conditions fostered enormous distrust of the typical players in Austin’s real estate boom: developers and the city. Meanwhile, Austin, one of the fastest growing cities in the country, has experienced a freight train of development speeding eastward from downtown. Working-class neighborhoods have transformed into a new urbanist’s dreamscape of a “compact and connected” city, but also experienced the displacement of the working poor and eradication of culture. And so, Govalle-Johnston Terrace’s residents have been fierce opponents of development for years—fearing the impacts of rising property values and taxes. 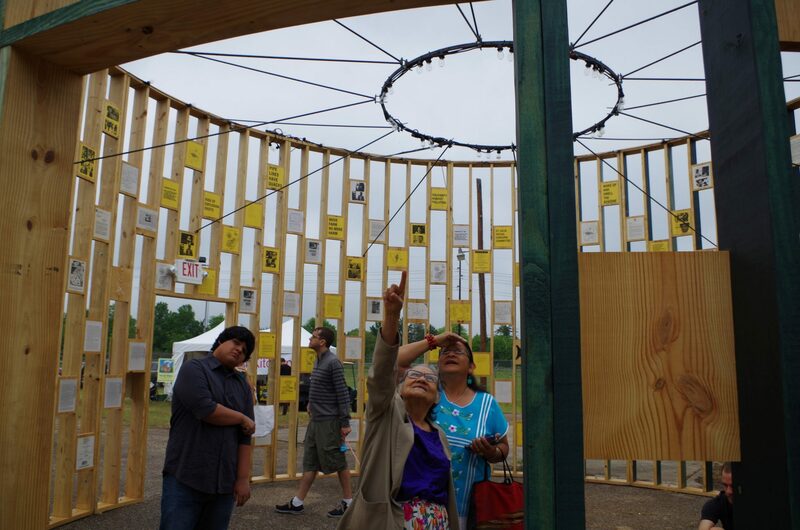 In 2014, Fusebox, a nonprofit that brings together artists and audiences, and where I am the managing director, was invited to work with two private property owners in Govalle-Johnston Terrace to help imagine how their 24-acre former brownfield—which they called thinkEAST—could be a home for artists and creative industries. Inspired by the work of Better Block in Dallas, ReBuild Foundation in Chicago, Project Rowhouses in Houston, AS220 in Providence, SESK in Brazil, and the decades-long fight by neighborhood leaders to get the site remediated from years of environmental abuse, we set out to design a radically inclusive planning process that would place two key groups at the center: the immediate neighborhood and the arts community. Our process led us to flip the script on typical community meetings. Fusebox had never led a real estate planning process before. For 10 years before embarking on the thinkEAST project, we produced an annual festival of contemporary art and performance throughout the city. We understand the power of festivals to bring people together and create an energized community; but then they disappear as if nothing had happened. When given the opportunity to work on thinkEAST, we decided to approach the project from our area of expertise and asked whether a festival could leave behind something long lasting. We put together an advisory group during the summer of 2014 made up of artists, longtime and new residents, educators, business leaders, activists, and government officials. By April 2015, we had met with over 700 individuals across a variety of backgrounds and sectors. Most of these meetings were small conversations over lunch or coffee, but we also attended neighborhood and civic meetings, community celebrations, and presentations. It was important to be transparent and accessible to contrast what we were doing with the typical development process. We documented every meeting and conversation with audio and video recordings, photographs, and detailed notes that were shared through blog posts and email updates. In April 2015, halfway through the 18-month planning process, Fusebox and the thinkEAST team hosted a “living charrette” as part of our annual Fusebox Festival. A “charrette” is an architecture and planning term for an intensive design meeting, often held to solicit public input, but also often fairly daunting for the public. In contrast, the living charrette was hands-on, fun, and could be experienced on one’s own time frame. It included 66 events and activities ranging from talks, workshops, performances, installations, and more traditional design engagement methods like visual preference boards, community asset maps, and interviews with planners. 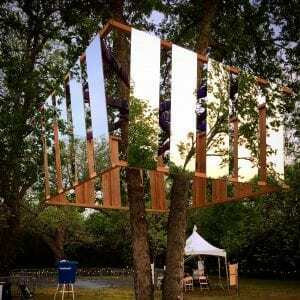 The four-day event was designed to prototype, in full scale, the future thinkEAST development based on all the input the team had received in the process thus far. 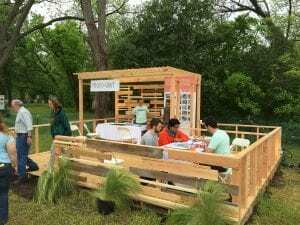 A pop-up village covered about 2 acres and featured a microliving unit, a design center, a community workshop space, local food/drink vendors, walking trails, and a solar power station. The living charrette included activities for all ages, materials in English and Spanish, and programming targeted for neighbors and visitors. The goal was to show stakeholders and the neighborhood what ideas were rising to the surface, and to invite additional feedback. Over 2,000 people attended the charrette—many of whom were likely drawn in by the festival’s art offerings. They provided feedback on transportation, housing, health, commerce, open space, educational resources, and local traditions. Participants expressed their opinions via handwritten comments, sketches, or collages, which were shared over social media and on screens and bulletin boards throughout the site. Photographs captured the density models that participants made with LEGOs, and the thinkEAST team worked with a local radio station to record stories, interviews, and oral histories from neighbors and local artists. The volume of data and input collected from the charrette exceeded expectations. More than half of the events at the living charrette were designed and led by artists. Placing arts and culture at the center of this effort was critical in maximizing engagement. The most effective approaches found a remarkable balance between the creation of a high-quality works of art with deep and meaningful involvement from the neighborhood. The input received before and throughout the living charrette made it clear that the top priorities for both artists and neighborhood residents were affordability/financial inclusion, health, open space, education, and culture. Since the planning process was completed in early 2016, thinkEAST has begun implementing the master plan developed by and with the community, with construction expected to begin in late 2016 on over 200 units of affordable housing, 8 acres of parkland, an innovative health hub, a cultural campus for artists, and space for creative industries. Arts and culture can be more effective in eliciting community input than traditional planning methods. As an arts organization, we were uniquely positioned in our community to build meaningful relationships and trust with neighborhood leaders simply because we were not property developers or city officials. Additionally, engaging with culture is something people do every day through food, music, and art, which breeds a level of comfort and familiarity that does not exist when people are asked to attend conventional real estate planning meetings. Better, deeper engagement leads to better, more sustainable plans. Incorporating our engagement process into existing civic and cultural activities yields better attendance and input than asking residents to take additional time from their busy lives to attend special community meetings. Many of the issues that surfaced throughout this project—gentrification, displacement, and cultural eradication—are more complex than we ever imagined, and are deeply tied to racial inequity. For most of its history, the Govalle-Johnston Terrace neighborhood was predominantly African-American and Latino, but that is changing along with much of East Austin. Our privilege as white male arts professionals surfaced difficult conversations and truths in our early efforts to engage residents and artists of color. We had to learn, and continue to learn, to acknowledge this privilege, dismantle it when we can, and keep making space for these important conversations. We also learned that inclusion is good, but agency is better. Inviting community members to the table and asking them what they think their neighborhood should be like was powerful, but giving resources and space for stakeholders to truly steer the design process was where we saw the widest impact. If we were to repeat this process for another project in the future, we would like to find more opportunities to go beyond inclusion and invest more in building agency. Our process is only as strong as the partnerships it is built upon. Having property owners who are willing to operate as social impact investors is an important ingredient in the project. Our other partners had a willingness to work in new and unfamiliar ways with unconventional partners. Building a team that is open, flexible, and genuinely collaborative was essential to our success. The landscape architects who helped create the master plan said this project was unlike anything they had done before, generating significantly more engagement than any previous traditional charrettes they had led. The city has embraced thinkEAST and the planning process as the tip of the spear in its efforts to address issues surrounding affordability and displacement citywide, and neighborhood leaders and activists continue to call thinkEAST a “model” for responsible real estate development.